The Phoenix Family of Helium Leak Detectors provides the solution for precise helium leak detection applications. The Phoenix Family are portable/transportable solution for sniffing and vacuum helium applications. With the large display, easy integration menu and the industry leading 36 month filament warranty, the Phoenix represents the leading solution in helium leak detection. 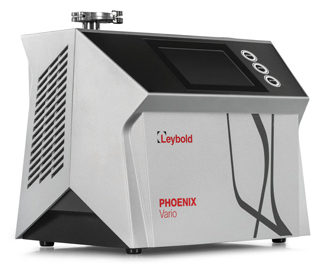 Phoenix Quadro Helium Leak Detector- this unit has a rotary vane vacuum pump and represents the portable high sensitivity solution for leak checking. Phoenix Vario Helium Leak Detector- the leak detector for production applications where an external pump is chosen to match the application. QT 100 sniffing system for applications requiring hose lengths to 100 ft. 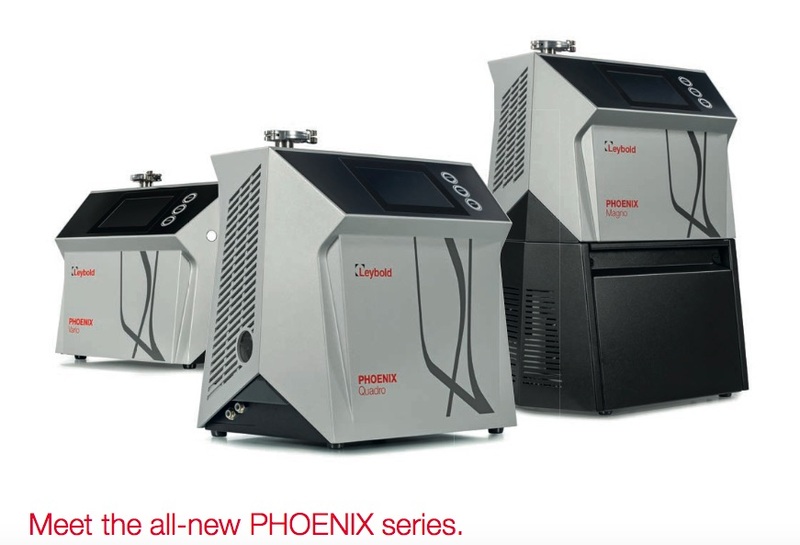 The Phoenix Series is available in both wet(oil pump) and dry configurations. For production applications, the Phoenix Magno, or Phoenix Vario Helium Leak Detectors incorporates a separate higher capacity vacuum pump for quick evacuation. 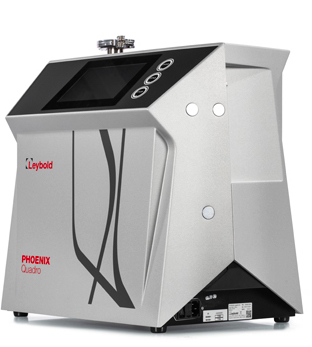 The Phoenix Quadro Dry Helium Leak Detector is designed for clean rooms and other areas where particulates are a concern. 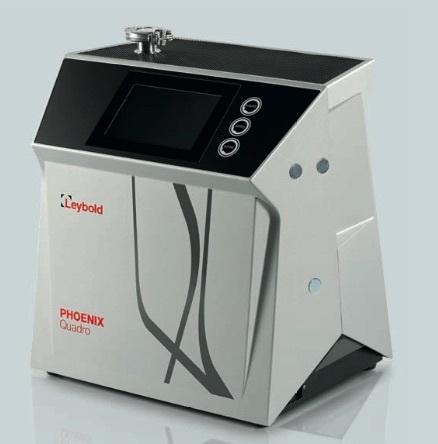 The Phoenix Quadro is a compact helium leak detector with roughing pump (Leybold D2.5E) inside the unit. The Phoenix Quadro is a portable unit good for leak checking vacuum systems, use at power plants for leak checking condensers and other general applications where precise leak detection is needed. The Phoenix Quadro Dry is the oil-less version of inside with diaphragm roughing pump.. 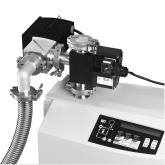 The Phoenix 300i Dry is a portable unit good for leak checking vacuum systems where oil cannot be tolerated in the system. The Phoenix Magno comes with a larger wet or dry pump that allows for quicker evacuation. Production applications require quicker pump down to meet application production rates. 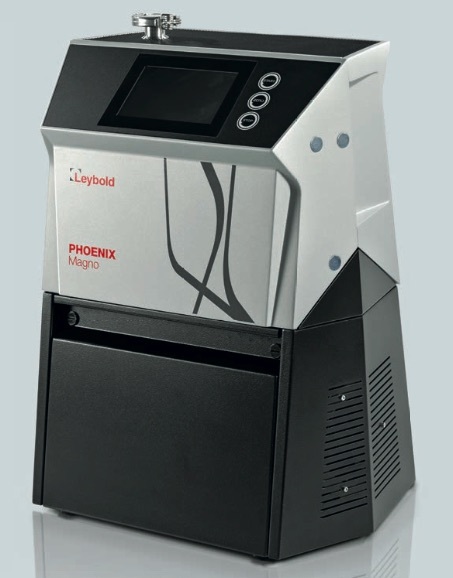 The Phoenix Vario allows the user to pick the right vacuum pump to fit your application. This allows for changes needed when the application changes. It also allows the user to upgrade to dry pumps in the future. The sniffer probe is a hand held sniffer accessory for the Phoenix 300i. The button on the remote zeros the unit when connected to the Phoenix 300i. There is a green "go" and red "leak" indicator on the probe. 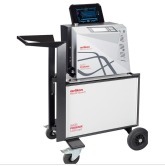 This cart is for the Phoenix Quadro Helium Leak Detector. 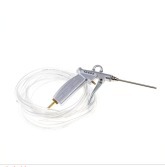 The Helium Spray Gun is used to spray helium at very low flow when conducting a vacuum leak check. Using too much helium contaminates the environment and increases the background of helium in the area, making it more difficult to leak check. 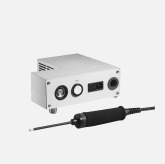 The QT 100 is used if you need to use a helium sniffer at a length greater than the standard sniffer probe of 16 ft. The QT 100 can be used for distances of up to 100 ft. 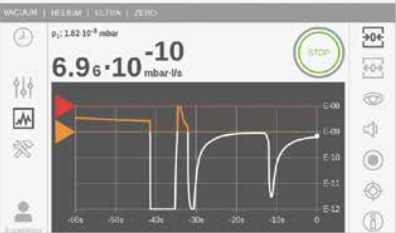 There is a separate pump in the QT 100 to help draw in the sample. 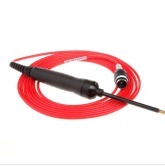 This is the probe and line that goes with the QT 100 for distances up to 100 ft. The Partial Flow Valve is used when the Phoenix 300i is used in vacuum mode but the volume of the vessel or chamber to be leak checked is too big for the rough pump in the Phoenix 300i to handle. 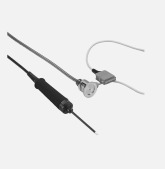 The Partial Flow Valve opens/closes based on a signal from the Phoenix 300i. Once under vacuum, the Partial Flow Valve tries to close to maintain ultimate helium sensitivity for small leaks.